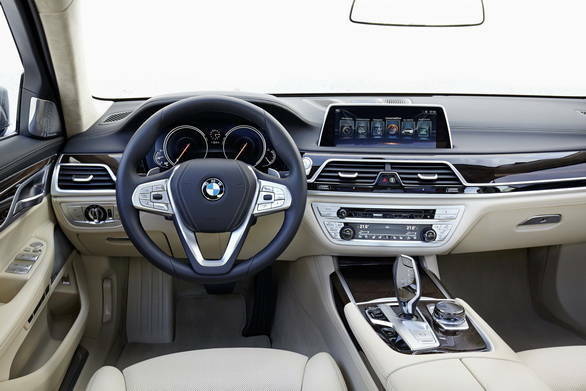 I'm writing this from the back seat of a brand new 2016 BMW 750i. We are somewhere in upstate New New York about 40 minutes from the city by helicopter. And I'm impressed but not totally. It's a brand new car. BMW are expanding the application of the carbon fibre expertise they have gained in developing their i line of cars. The new sixth-generation 7 is about 130kg lighter than the old one. BMW lays the credit at the feet of the new frame core that is made from steel, aluminium and yes, carbon fibre. One assumes that a full carbon core would be overkill when you have a 445PS engine bringing the grunt. 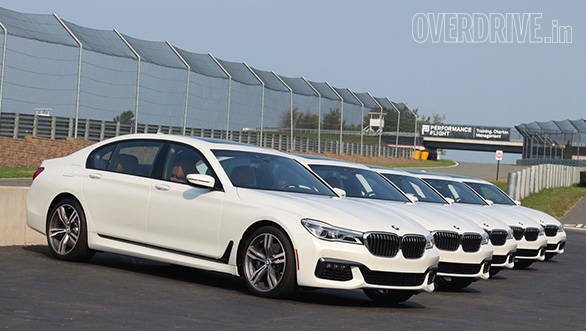 BMW also underlines, repeatedly, that the 7 Series has always been a high technology automobile, resolutely taking steps forward with every generation. BMW says many commonplace ideas like ABS, electronic cruise control etc all debuted in previous generations of BMW's flagship. This time, there are 25 new features - which we will come to later - that BMW deploys which will, naturally, trickle slowly down to its smaller cars in time. 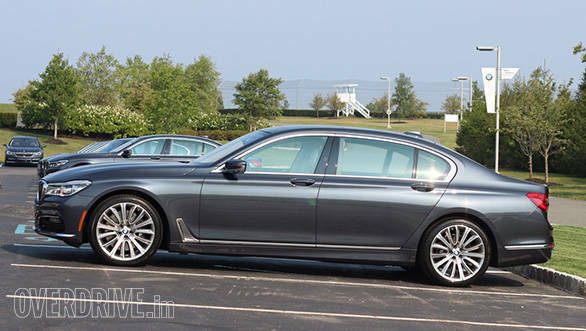 Engines, there will be others including a 750e plug-in hybrid that will show up later. For this drive, we got to test the all-wheel drive xDrive 750i. India-spec cars get the standard 730Ld and the 750Li, both of which are already available in India. The new cars get more efficient engines with better power and torque ratings as well as fuel efficiency. 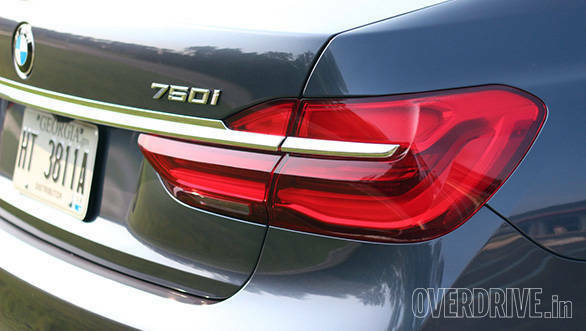 The 750Li is expected to come first as a CBU and it will be showcased at the Auto Expo 2016. The 730Ld is expected a bit later but it will be offered as a CKD and therefore pricing will be more competitive. Unfortunately, given that the US market is more conducive to petrols, we did not have a diesel powered 7 to drive. The 7 is meant to be a luxury missile of sorts. That means at straight line performance, you'll marvel at how quickly a car this large can gather momentum. Or flip a switch and settle into a magic carpet with memory seats. I drove for about 40 minutes on the street and it's an impressively quiet and smooth car. We obviously had the petrol and there isn't much to note on the refinement front. But drive in a chauffeur-ly manner, and you can only tell the engine's still in the car by the progress you're making. It's substantially silent as cars in these upper echelons are expected to be. Switch to Sport mode and that composure is replaced by a rather civilised aggression that will allow a muted roar to ooze smoothly into the cabin. It's fast. It'll nearly keep up with an M5 to 100kmph but that isn't, obviously, its purpose. 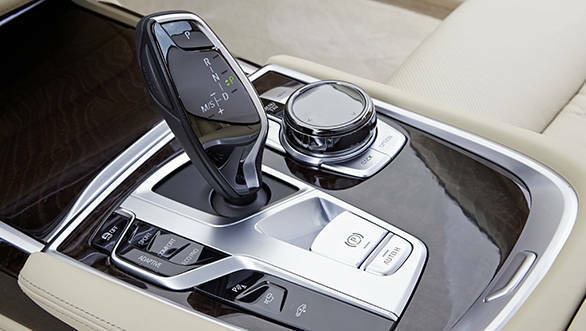 The 8-speed dual clutch automatic is very good at its job. Shifts are quiet and swift. Downshifts, whether automatic or paddle-shifter initiated, arrive rapidly. The system learns from your driving and tailors itself to your liking over time. It also talks to the navigation system so it prepares for climbs and corners too. The feel is of a gracefully fast car of large dimensions and great opulence at all times. Well it certainly doesn't want for space. 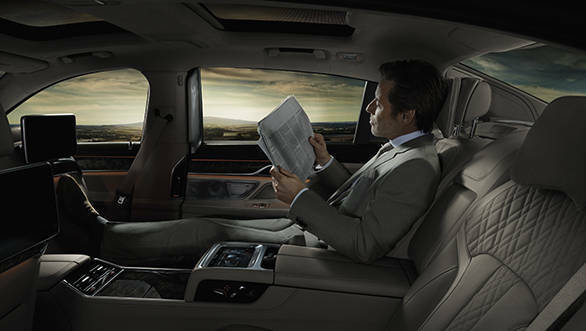 Our car was specified with a two seat rear with a wide centre console that has the executive seat. That allows the rear seat passenger to slide the front passenger seat all the way forward for leg room. A small foot rest folds down from the back of the seat ahead so you can stretch out. Once you're done fiddling with the gizmos, you'll notice a really plush feeling leather seat with exquisite stitching and all kinds of massage and adjustment features. In fact, I'm also feeling a little guilty - I'm getting a gentle back massage while I waft along at the speed limit and write this. No, driving isn't fully automated, another journalist is driving. So what new features does the car get? 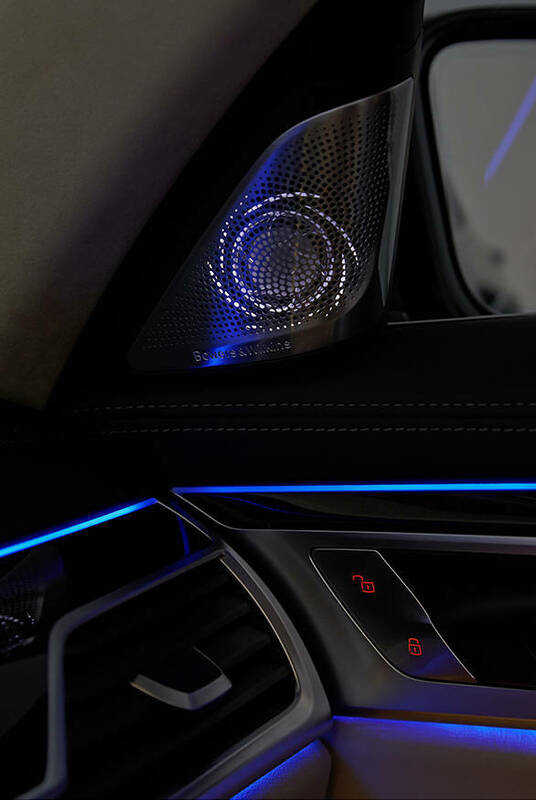 BMW adds a slightly gimmicky sounding gesture control which turns out to be less annoying than you'd imagine. We quickly got used to rotating a finger counter/clockwise to control the audio volume. You start out making giant, awkward circles before you pare that down to smaller and smaller gestures which still work. I imagine that an owner/chauffeur would rapidly get used to doing that unconsciously which is perfect. BMW also includes a two-finger pointing gesture that is customisable. In our car, we successfully used it repeatedly to switch radio stations. Especially whenever we chanced upon Mariah Carey. Never be a Hero in company. Not just that. The new Touch Command system adds - I'm amazed it took this long, really - a touchscreen interface to BMW's updated new iDrive system. 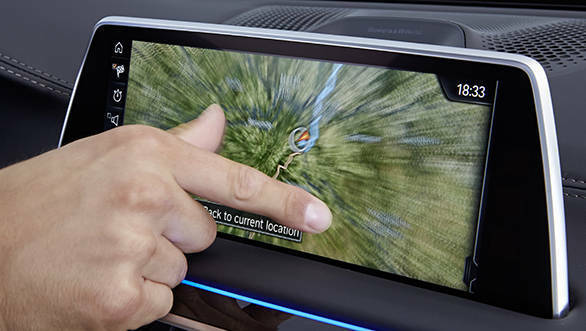 This makes the system a lot easier to use and BMW even uses two-finger touches like a pinch to zoom in to a map. The rear passengers get a 7-inch Samsung tablet that's integrated very neatly into the centre armrest. 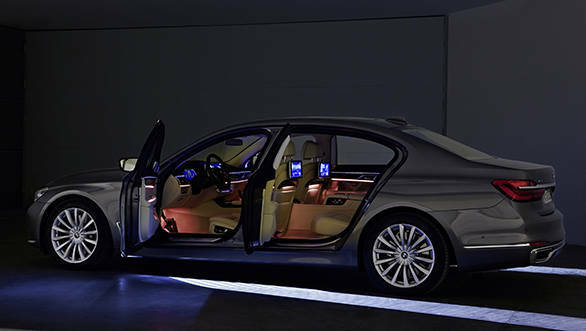 It controls almost all the functions though the chauffeur is still a voice-activated interface. Of course, sir. 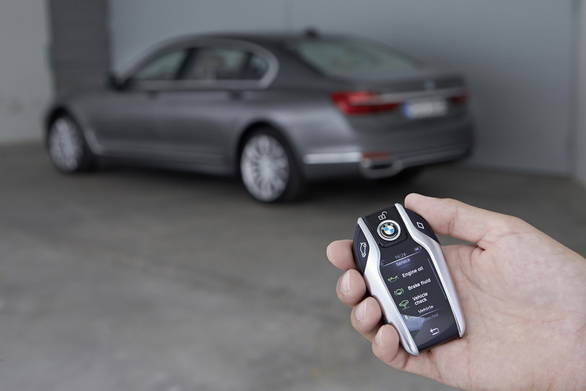 The BMW's new key is a touchscreen marvel too. It connects to the car's Wifi hotspot and can (within range) offer you a quick glance at car information. You can also pre-start the aircon to cool a car sitting out in the sun. The thing is it looks super cool and I almost wish they'd taken it all the way - I'll explain in a bit. There's also an inductive charging slot in the storage compartment next to the driver, a terrific 360° camera system that now paints a very useful external perspective that is very handy if parallel parking, for example, foxes you. And of course, there's the 1400W 16-speaker Bowers and Wilkins music system that sounds terrific and get this, the speakers are illuminated from inside. For the ambience. 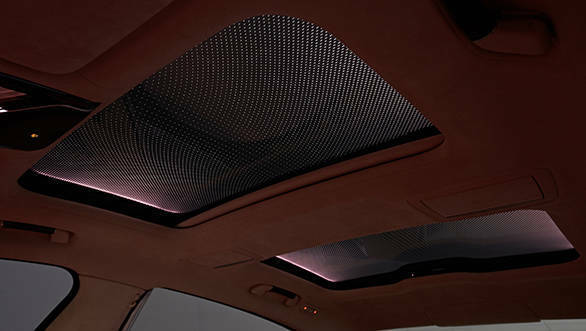 And of course, there is a startlingly comprehensive mood lighting setup, a puddle lamp on the form of lines that lead into the car and more. How does the engine feel now? It feels faster for sure. The lighter weight makes the engine feel like it is getting more results for the same effort. 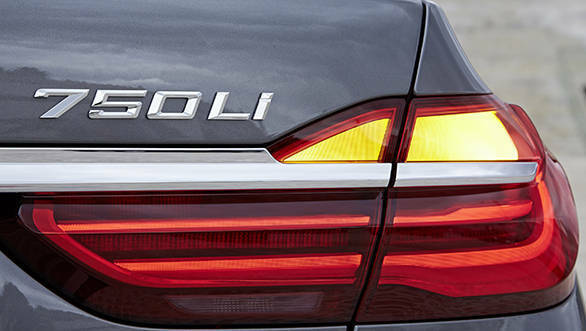 The refinement levels are better and in general, the 750Li felt more 'on it'. See the badging? It says 750i because only in the US, the L badge has been taken off. 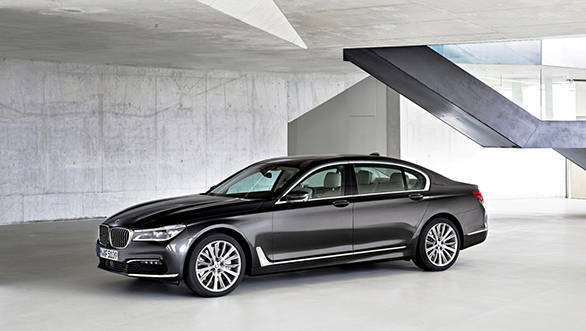 BMW's designers went all out to create an imposing car. Which is why the tail lights are wide but not tall etc. Unfortunately, while this certainly gives the car presence, pretty it isn't. The previous generation wasn't pretty at all and this one is a small improvement. Presence? Oh a lot, yes. Elegance? Ooh er. I found that the optional entertainment screens on our car were the only non-touchscreens in the car and that drove me around the bend. After the natural simplicity of all the other touchscreens, this one was maddeningly difficult to use to change settings, for instance. The 7-inch tablet at the rear is a Samsung, complete with branding on the back. It's beautifully integrated and the release mechanism is simple and works very well. But really? A Samsung tablet for a luxury car? I know I'm regarded as an Apple fanboy but this comment comes from an Android fan, not me. Finally, I think if BMW had actually used the new secure NFC tech, sort of like Apple Pay's underlying authentication mechanism instead of this rather pretty key, it would have been a lot more impressive. And one less thing to charge and to carry around. When can I get one? Or two? 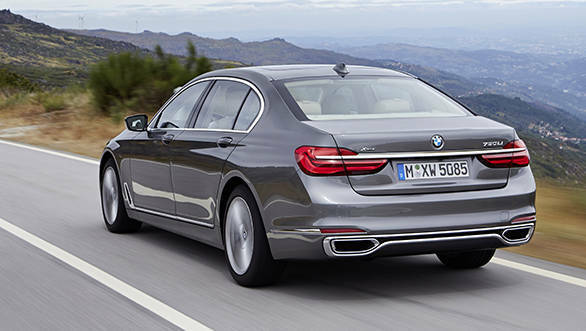 We expect the 730d and 750i (long wheelbase with or without the L designation) to go on sale in India sometime next year. Prices should rise by a modest amount and Rs 1.1-1.5 crore (ex-showroom) is what I'd ask my banker to set aside towards the acquisition of transpiration assets sometime next year. And now, if you'll excuse me, I'm going to use the new BMW Full Body Activation program to get some exercise. It awards stars for effort and I intend to get at least a, ahem, seven.